HAMPSHIRE, England – Education is the key to breaking the influence that media-savvy, violent extremists have on young, disaffected Muslims, the leader of the Ahmadiyya Muslim Community (AMC) believes.Security officials estimate up to 700 people have left Britain to become involved with extremist groups such as the Islamic State (IS). About half have returned. At least 43 women and girls have fled to Syria in the past year. The British government has responded with controversial new laws, including the right of parents to cancel their radicalised children’s passports. The Caliph believes the problem is so serious that mosques and Islamic schools should be monitored by security services.The crackdown comes as the latest UK police figures show hate crimes against British Muslims have soared by more than 50 percent.Mansoor Clarke, imam at the UK’s largest mosque, Baitul Futuh Mosque in Morden, in southwest London, has encountered Islamophobic people who think all Muslims are IS supporters or “terrorists”. He counters this by promoting Islam as a peaceful religion, educating followers against extreme acts and leading fellow Ahmadis in carrying out charitable deeds. “If we do that, it’s impossible for someone to turn around and say, ‘Yes, but you’re obviously a terrorist on the side,'” Clarke told Middle East Eye at the Ahmadis’ three-day event that ended on Sunday. 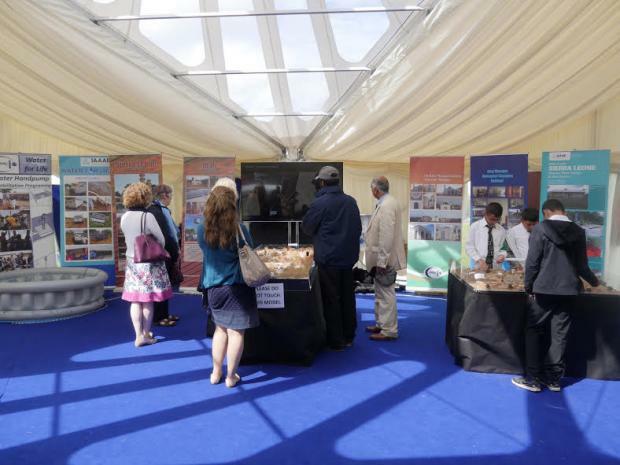 Helping others forms an important part of the Ahmadi faith, and is carried out in a wide variety of ways. Muhammad Sharif Ode, AMC president of Israel and Palestine, one of 250 Arabs in Hampshire leading a group of 50 Ahmadis from his mosque, said he led interfaith programmes between groups including Jews, Christians and Muslims in the Kababir neighbourhood of Haifa, Israel.“I’m part of a council that brings students of different faiths together for interfaith dialogue,” he told MEE.“We had our convention in Israel, and on the first day, we invited those who speak the Hebrew language, including rabbis, and we created harmony. “It’s very strange for the conservatives and the reformists and the orthodox to have dinner or lunch together,” he said, chuckling happily at the achievement.Ahmadis have faced persecution in countries including Pakistan, where it is illegal for members of the Ahmadiyya community to call themselves Muslim.Some traditional Muslims call AMC members heretics because followers do not believe Muhammad was the final prophet sent to guide mankind. Ahmadis believe Mirza Ghulam Ahmad, who founded the faith in 1889, was also a prophet and the Messiah. That belief led to the Lahore massacre in 2010, in which 94 people were killed in dual attacks on Ahmadiyya mosques.The Caliph and his followers respond to persecution by choosing prayers over violence, according to London Imam Clarke.“What we believe in is [that] the concept of faith is between the individual and God,” he said. 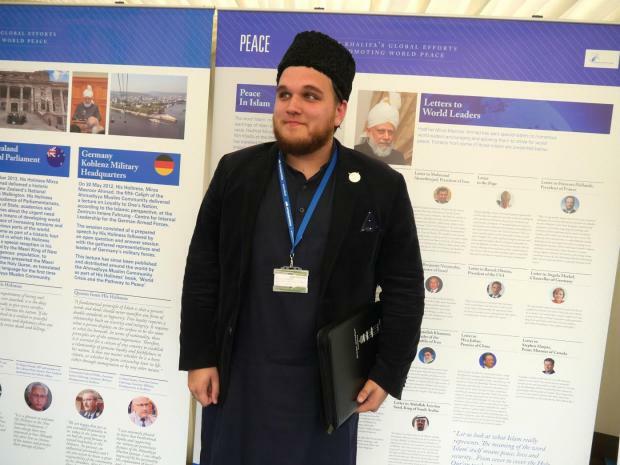 “If someone came in today who was completely against what we do, we still couldn’t pass a judgement on his faith.”Syrian Reem Shraiky told MEE at the Jalsa Salana that although Ahmadis were restricted, they were never physically attacked under the government of President Bashar al-Assad.That changed when the civil war erupted in 2011. Ahmadis are now attacked by the Assad regime and rebel fighters including IS and al-Nusra Front because they seek democratic solutions over violence, Shraiky said. She left her homeland more than six years ago, but two sisters still live there. Her brother left for Turkey 18 months ago after being tortured by Syrian soldiers. He was pleased when they told him they were doing so because he is Ahmadi, because that meant he was a true Muslim, Shraiky said. While Ahmadis do not advocate violence, some in the Muslim community are critical of their raising £400,000 for the Poppy Appeal, organised by the Royal British Legion, a non-profit organisation that helps war veterans and their families. The Caliph teaches followers they should support the country in which they live because it is a part of their faith. Ahsan Chouly, from southwest London, who works in finance but volunteered for nine-hour shifts as a packer in the bread-making department that produced an estimated 3,000 pieces of naan per day during the Jalsa Salana, raised £600 for the Legion during a charity hike through the Bavarian Alps last month. The group raised £20,000 in total. Chouly noted ruefully that the years AMC has spent helping the Legion and the Poppy Appeal have been overlooked by the tabloid media, which ran scathing headlines when a small group of Muslims burned poppies, a symbol of fallen soldiers since the First World War.“I was asked the question by a non-Ahmadiyya Muslim friend of mine as to why I’m raising money for the Royal British Legion,” he told MEE. Share the post "Ahmadiyya Muslims rally in UK for peace over violence"